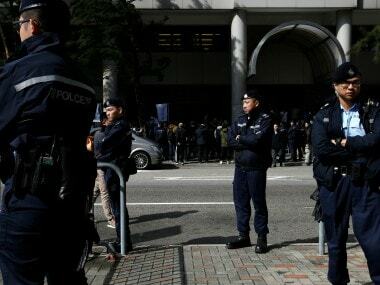 Hong Kong: Five people were killed and 32 injured when a coach carrying Cathay Pacific staff to Hong Kong’s airport collided with a taxi on Friday, police said, with passengers thrown from the coach’s windows on impact. The back half of the taxi was completely crushed and both sides of the bus were damaged with traces of blood on the outside following the crash on the island of Tsing Yi. “We believe the taxi was broken down and stopped on the left lane of the road. Around 40 seconds later, a coach hit it from behind,” police superintendent Yip Siu-ming said. The coach then lost control, Yip added, hitting the right-hand side crash barrier and then the left one and throwing three passengers out of the coach. The 62-year-old driver was also hurled from the vehicle and injured. The taxi driver and two men and two women coach passengers were killed, according to police. Debris including glass and personal belongings was strewn across the road, which remained closed early Friday. Hong Kong carrier Cathay Pacific confirmed, “a shuttle bus carrying our employees was involved in a traffic accident this morning”. “It is a tragic and very sad incident. We extend our deepest condolences to the families of those who have sadly passed away,” the airline said. Superintendent Yip said police would look into whether the coach driver — who had been working for 10 hours at the time of the accident — had been tired or whether he’d been drinking. “From what we can see, it’s obvious that the driver did not see the broken-down taxi on the road and hit it from behind,” Yip said, adding that his working hours were from 7.00 pm to 7.00 am. Tsing Yi is connected by a freeway to Hong Kong International Airport which is located on neighbouring Lantau island. Television footage showed the injured being treated by the side of the road before they were taken to four hospitals. The South China Morning Post reported that several of the injured were in serious condition. One coach passenger said the bus had been travelling fast before it crashed into the taxi which had its hazard lights on, according to SCMP. “It seemed to me that the coach did not slow down. I fell onto the floor (when it crashed),” the passenger said. A passenger told local television channel TVB the scene on the bus was “very chaotic, we were crushed together”. Another said “the bus hit once, then hit left and right, and hit the roadside to stop.” Television footage showed the crash barrier on either side of the road was damaged. The accident happened at 5.00 am (2100 GMT Thursday) near the exit of a tunnel. Hong Kong prides itself on having one of the world’s best public transport systems but deadly bus accidents are not unknown. A speeding double-decker overturned in northern Hong Kong in February, killing 19 people and leaving more than 60 injured. The bus driver was arrested for dangerous driving. And in 2003 a double-decker bus collided with a truck and plummeted off a bridge, killing 21 people and injuring 20.